Keeping mental focus while praying your Rosary can be a struggle. Introducing the Rosary Army App. You know how it feels to realize in the middle of your Rosary that you’re meditating on your grocery list instead of meditating on Jesus. Or you find yourself thinking about your this weekend’s events instead of the events of the Life of Christ. Driving along and completely losing count of the Hail Mary’s you’ve said or even flat out forgetting which Mystery you’re on! And even when you are ready to go deep in prayer, have you ever wanted to pray a Rosary but didn’t simply because you didn’t have your physical Rosary with you? And while it will never replace holding a Rosary in your hands, we’ve got the solution to make it easier to pray the Rosary on the go while driving, exercising, or cleaning the kitchen. We’ve go the solution to help your focus. To give you something on which to train your eyes on the life of Christ. And to make you feel like you’re not alone while doing so. Introducing the official Rosary Army Mobile App. It’s an answer to prayer...to help you pray. And every download goes to support the ongoing work of Rosary Army, which has been dedicated to making, praying, and giving away millions of Rosaries since 2003. The official Rosary Army Mobile App provides over 4 hours of professionally recorded audio rosaries which include all four Traditional sets of Mysteries, all four Scriptural versions and the first ever Holy Hour Rosary (all 20 mysteries in one rosary prayer recording) to get you through the day, helping you stay mentally anchored while reciting the Rosary. And not only do you access to beautiful and thoughtful artwork and features, but 100% of all proceeds supports Rosary Army’s mission: to make, pray and give away all-twine knotted Rosaries. And be a witness of strength to those around you. 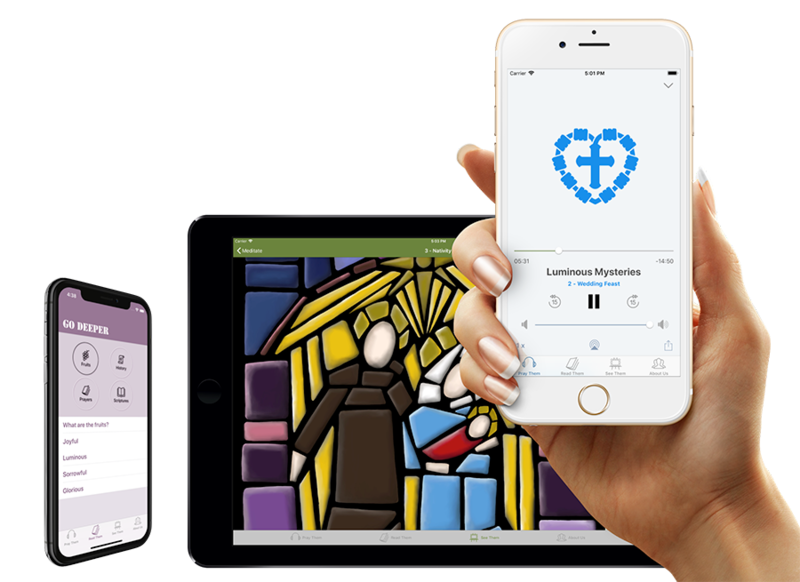 STREAM THE AUDIO ROSARY WITHOUT WI-FI! Click on the Rosary Army Mobile App PRAY THEM tab for instant access to newly recorded and updated traditional rosaries, scriptural rosaries and access to the brand new Holy Hour Rosary! That’s nine BRAND NEW Rosary recordings for your spiritual development. Just tap the Rosary you want to pray and listen to. And with a fully offline experience, you’ll never need Wifi or use up valuable data to play these recordings. They’re all stored directly in your mobile app on your iPhone or iPad. 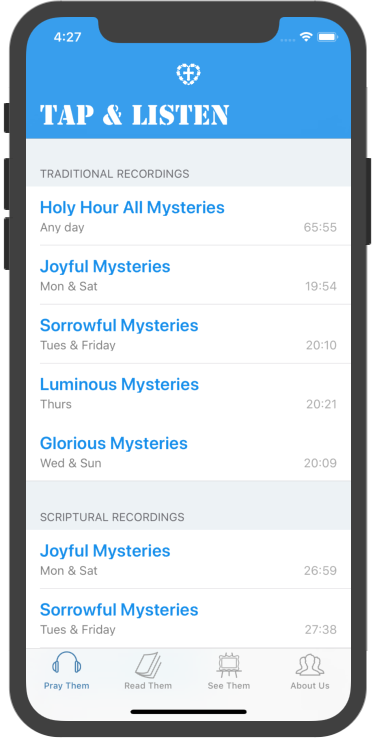 These are all new versions of our audio Rosaries that have been downloaded over FIVE MILLION TIMES! 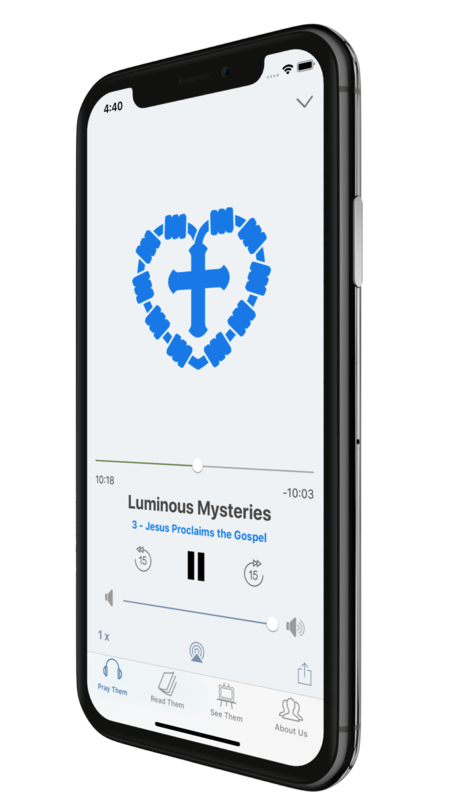 With the Rosary Army Mobile App READ THEM feature, you’ll finally satisfy your curiosity as to which scriptures are used as the basis for each mysteries. Reconnect with the Fifteen Promises of Mary as to why praying the rosary is so valuable for our souls. 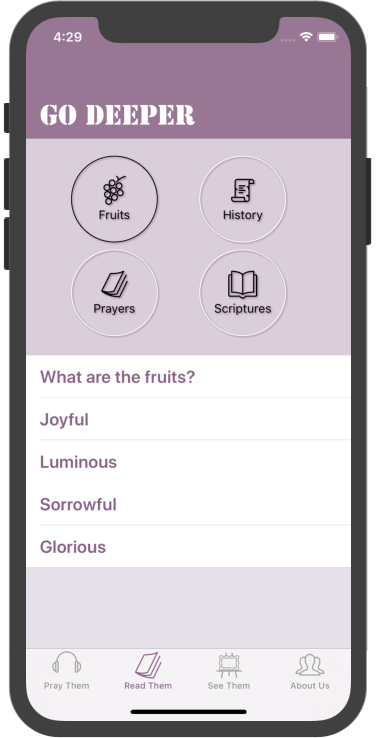 Have quick access to information about the spiritual fruits of each mystery and so much more. Visit the Rosary Army Mobile App’s virtual art gallery in the exclusive SEE THEM feature. Designed to pull your mental focus back on Jesus, where it should be, it’s art that inspires and engages, making it easier to keep your mind on Christ and less on the chaos of the day. 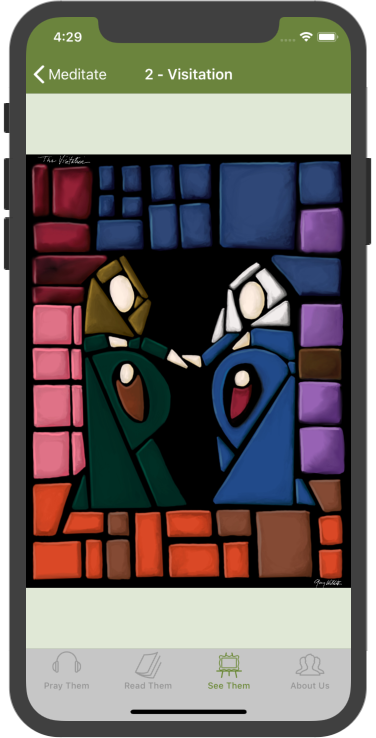 Here you’ll find custom commissioned digital artwork reflecting the life of Christ. Initially launching with seven images, the remaining thirteen images are planned for release in successive updates. Downloading this ONE app satisfies TWO amazing goals! Give yourself a valuable resource to help you grow closer to Christ and at the same time, help Rosary Army continue its mission of getting physical rosaries to those in need. ALL PROCEEDS FROM EACH DOWNLOAD HELPS ROSARY ARMY PROVIDE PHYSICAL ROSARIES TO THOSE IN NEED! *Currently available for Apple mobile devices running iOS ver. 11.0 or higher. Android version to be developed next. Copyright 2018, New Evangelizers, Inc. All Rights Reserved.